From sheers to heavy-weight curtains, Goelst offers a comprehensive range of curtain track systems suitable for most applications. Goelst curtain tracks provide fixing options for most surface finishes. Many profiles can be pre-formed to suit customer requirements. 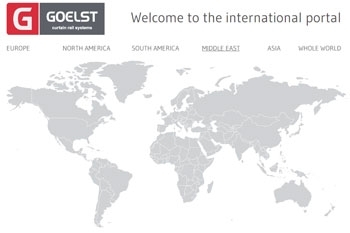 Goelst has its own R&D department and now possesses various patents and design protections. Goelst will certainly maintain its leading position in the market in the coming years with its intelligent solutions and creative innovations. Goelst started in 1979 as a sole proprietorship in interior products, started by Rolf E. Goelst. Already after a year the company expanded the range with a curtain rail program under the name G-Rail. The 9 years of experience that Rolf Goelst had already gained in the curtain rail profession, he could put to good use for his own company. Corporate social responsibility is a high priority at Goelst. Our products are produced mainly in the Netherlands, meeting the most stringent environmental standards. This means that we monitor our CO2 footprint and strive for the lowest possible CO2 emissions. Goelst monitors the quality of all its products continuously. We have chosen not to produce in low-wage countries because of the combination of our high quality requirements and corporate social responsibility.